You are here: Home / LIFESTYLE / Relationships / Which Style Engagement Ring is Right for You? An engagement ring says a lot about a person. Not only is it indicative of your relationship with your significant other, but it also speaks volumes about your style. As you shop around, make sure you know exactly what you’re looking for. Prong or solitaire setting. Simple, yet classic – the solitaire setting features a single diamond with metal prongs holding it tightly in place. The minimalistic nature of this setting allows the diamond to be shown in all its beauty. The halo setting. The halo setting refers to the placement of a single diamond in the center, with lots of smaller diamonds and gemstones in a circle around the center stone. Within the halo category, there are a handful of subcategories. Browse the Sylvie Collection to see some of the different looks. The channel setting. This style of ring is a lot like a solitaire setting, but it has a row of diamonds built into the band. This gives it a unique look with a little more sparkle and shine. Three-stone setting. As the name suggests, a three-stone setting features three diamonds in the setting. The center stone is typically larger than the other two stones and it’s common for the accent stones to be colored or cut differently. You probably have a style or two that catches your eye, but how do you know which engagement ring style is right for you? In other words, what setting complements you well? 1. What’s Your Fashion Style? Traditional and elegant. Do you wear traditional clothing that’s conservative, yet elegant? If this is your look, you don’t want a ring that’s too flashy or over the top. 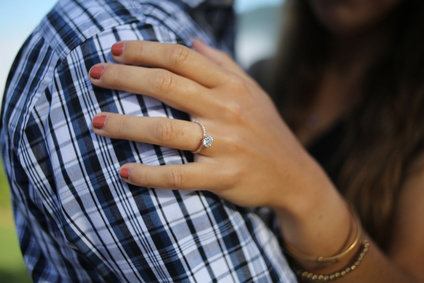 A simple solitaire or three-stone setting would be a good place to begin your search. Stylish and trendy. If you take more risks with what you wear and prefer to be on the cutting edge of style, you might want something a little more prominent. A halo setting with lots of sparkle would be worth considering. Active and outgoing. Do you spend a lot of time outdoors or exercising? You probably won’t want something bulky. A clean channel setting could be a good option. Modern. Do you prefer sleek, modern style that bucks traditional form? You may want a unique setting designed just for you. Believe it or not, the shape and character of your hand and fingers may impact the style of ring that’s best for you. When comparing different rings, consider both the length and width of your fingers – as well as the overall size of your hand. If you have long fingers, you won’t have much trouble picking a style. Almost everything will work. If you have very slender fingers, smaller stones will make your fingers appear wider. Thicker bands also do a nice job of widening the look. For short fingers, oval, pear, and marquise stones help lengthen the appearance. With wide fingers, you’ll want stones and settings that elongate. You should also give a little consideration to the practicality of different rings. What sort of occupation are you in? Do you have hobbies? Do you play sports? Questions like these will provide some direction. An engagement ring is a highly personal piece of jewelry. While you’ll ultimately be happy with whatever ring you’re fortunate enough to receive, it’s always nice to pick out one that perfectly embodies your style and personality. Hopefully this article has provided you with some insights on how you can narrow your search and identify a style that’s right for you.